I wanted to share my shoe collection with you, guys. I must admit I have more shoes than you see here, so I had to play favorite, which was quite hard! These are the pairs I wear the most. You've probably seen most of it already. They're old, they'ye new, they're comfy, they're chic, they're expansive, they're cheap, but I love them all! Which pair do you like? My top 6 of the moment, brougth to me by Xtrastar, Asos, Sacha, Zara, Zara & Nike. PS: GIVEAWAY COMING UP, STAY TUNED! Oehh die witte van Xtrastar en beige van Zara zijn zo mooi! I love those wedges so gorgeous. Great shoes!! I liked the variety!! Thanks for visit my blog!! you have a nice blog girl!! we can follow each other, it would be great!! Love the black lace up booties! Thanks for checking out my blog, glad you like it! I'm following you so, follow me back!! These are absolutely gorgeous, I love the black laced up ankle booties. I'm following, after seeing your lovely comment, and hope that now you can follow back. 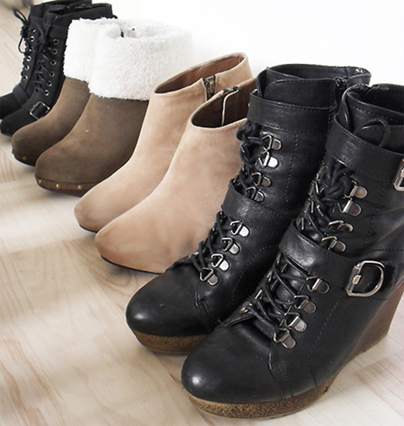 I love the black boots in the fifth picture on the right :D Great blog you have! Wauw! Geweldige collectie! Vind die met die punten supermooi! You have some amazing shoes!!! We're already following you, hope you'll follow us back!!! Fabulous1 you have shoes for all the moment and places! I'm following! I'm LOVING your shoe collection! I love your blog, definitely following. Would love for you to check out mine as well! Lovely shoe collection! I really need to invest in more shoes and thanks for the comment on my blog am now following! Wonderful shoe collection! My favorite pairs are the black lace-up wedged booties. Where are they from?? All of these are amazing but I especially love teh white heels! Je hebt 'n mooie blog, ik ga je volgen! You have an amazing shoe collection! Hey girl I invite you to visit my blog. It would be a pleasure if you could tell me what do you think of it! I see you have a great shoe collection! WAUW! Wat vet, die zwarte worker boot wedges zijn echt zo mooi! My faves by far are the canvas sneakers at the bottom. Love the white and black pairs and they look so amazingly good on you! Hope we see them a lot this summer! !